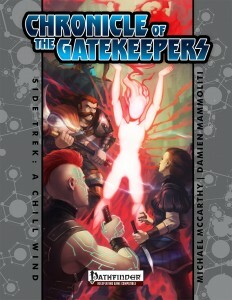 This sidetrek of the Chronicle of the Gatekeepers campaign serial clocks in at 11 pages, 1 page front cover, 1 page editorial, 1 page back cover, 1 page SRD, 1/2 page advertisement, leaving us with 6.5 pages of content, so let’s take a look! All right, still here? Large-biter sends the PCs forth to survey an odd, magical weather phenomenon – the frost-line. north of it, the earth is frozen, while south of it, temperate temperatures reign. The odd thing here being that the line moves from day to day. Large-biter assumes that the abundance of nexus gateways may have something to do with this strange phenomenon – the frost line is closer than usual and the PCs are to survey its effects. En route, the PCs can meet a feline champion, one P’tan simply known as “Captain” (EDIT: Yes, facebook cleared that up – the guy is called Captain – that’s his name…) – the P’tan is serving the Sanguine Covenant and is here to protect the populace from the Necryos, degenerate frosty vampire-like creatures that travel with the frost-line…and make sure the PCs are not working with the Vesparans. As a friendly ally, there’ll be an option for a nonlethal sparring match with the captain (nonlethal and rewarding characters who elected to learn to deal nonlethal damage…) and we also get a new P’tan magic item here. Over the next couple of days, the PCs will be continuously harried by the degenerate Necryos (full stats provided) – who even will attempt to lure the PCs directly into a yellow musk creeper and its vesparan slaves…and attack in ever-increasing waves until they’re vanquished. After some friendly duels (and favors in the future), it’s time to take a look at how the PCs fared regarding the suveillance of the frost-line – the more auccessfull checks they made, the more precise the gleaned information will be. Editing and formatting are pretty good, though annoyingly, the pdf sports several “See page @@”-notes where the proper page-number for the necryos hasn’t been filled in. Layout adheres to LPJr Design’s two-column full-color standard for the series and the pdf comes with a second version that is more printer-friendly – nice! the pdf has a neat full-color artwork of the necryos. The pdf comes fully bookmarked for your convenience, in spite of its brevity – kudos! Michael McCarthy and Louis Porter Jr. deliver a cool premise here – the frost-line is an unique, imaginative phenomenon and surveying it is a GREAT premise – seriously, it’s fresh, unique and fun. That being said, I *really* wished the module did more with this unique phenomenon – sudden movements of the line, unique hazards, some proper, nasty wilderness survival with quickly changing sweeps of the line…this module can be made absolutely awesome with some minor adjustments/additions of hazards…without them, we still have a solid, if a bit redundant array of combats versus the cool (pun intended) necryos. If this book focused a bit more on its unique premise over combats, this could have been excellent – as provided, it is a solid module with a great scenery – and hence, my final verdict will clock in at 3.5 stars, rounded up by a margin to 4. You can get this nice sidetrek here on OBS! You can get the whole subscription here on OBS and here on d20pfsrd.com’s shop!